My brother just called me to ask me if I knew how to get back into a Winchester brand gun vault because his battery had died and he replaced it and the electronic key pad would not accept his six digit code to get back in. I told him to try the factory original code, which did not work. I then asked him if he was sure his battery was charged. He had no idea, but said both his replacement 9Vs were set to expire in 2019. I told him I'd drive down and get a new 9v and not leave with a battery that was set to expire soon, so he drove down to the Publix down the road and after checking all the 9V batteries for the one with the latest expiration date he found one that expired in 2020 and out the door he went. Sure enough it was his replacement battery, both of them were deader than a door nail. I thought it might be a real good idea to check my storage vault and check all my batteries. Guess I better make a new colums in the ever growing spread sheet to things I need to keep a close look at. Oh man thats a good reminder! They say that switching from Daylight Savings time to Standard Time is a good reminder to refresh the batteries in your smoke and CO2 detectors as well. This thread is a sobering reminder to check that the "new" batteries you're using are actually still good. A cheap multimeter (even the $6 ones that they occasionally give away at Harbor Freight) is a handy thing to have, if for nothing else than checking your batteries. Good point on the cheap multimeter. I always hate it when alkaline batteries leak and screw up my devices, especially the ones where there is no hope of getting the batteries out because they became swollen. For critical devices or those left in storage I have switched to quality lithium ion batteries or rechargeable NiMh Eneloop batteries. For critical devices or those left in storage I have switched to quality lithium ion batteries or rechargeable NiMh Eneloop batteries. This is great advice and I do the same thing. Lithium batteries are much more expensive but a few extra $ beats cleaning out a leaked battery. Use the lithium in the devices and buy the alkaline for your inventory. I think this good topic should also extend to batteries in your cars, generators, cell phones and so on. Take the time to perform the checks and ensure there are no surprises on the day you will need to count on these energy storage marvels. Last edited by teotwaki on Tue Nov 06, 2018 5:35 pm, edited 1 time in total. I have a package of 40 Duracell AA alkalines with an expiration date on them of March 2027 that I purchased at Costco this past spring. I noticed that they didn't seem to be lasting very long in flashlights, then I started finding dead ones. Right now I have 26 of them that are completely dead, fresh out of the package. I contacted Duracell and they sent me coupons to replace the whole package. Just because you bought a "fresh" package with a good date on it doesn't mean they will be good. Test a few as soon as you buy them. I have noticed this problem a lot lately. There seems to be a lot of counterfeit batteries being sold these days. If you buy brand names they will replace them but if they are SHTF stock pile and you need them you could be in for an unpleasant surprise. Agreed. Generators especially need to be not just operated but load tested by running under a typical load. If you want to rely upon a device or a system you need to routinely test it. Can anyone recommend any good battery testers for AA batteries? I bought this one the other day. It is cheap and reliable. It does test under a small load. That said I use this to get an indication and not an exact level. Not bad but I wish it had more voltage ranges. 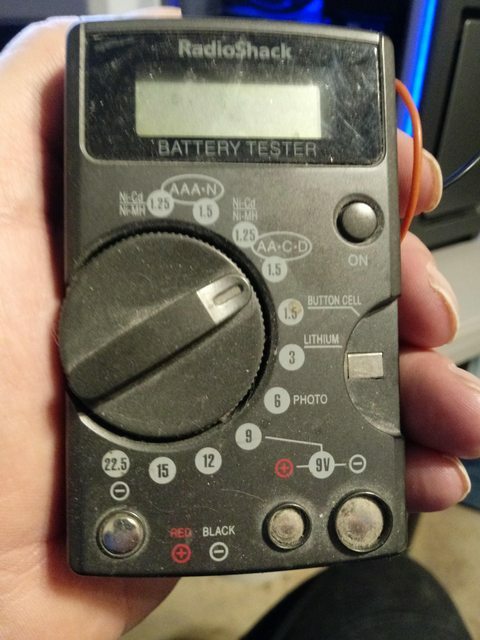 My old reliable Radio Shack 22-091 is my go-to tester for the past decade, but I'm looking for something better. Multimeter=smart prep. Sometimes things just go wrong at the factory & bad batteries get shipped out anyways. It's happened to me. All batteries are consumable items & they all have shelf lives. How I miss be able to stop in at S4. My corner of the world is still recovering from Hurricane Florence. I was fairly well prepared, but having a multimeter to check batteries of all sorts was handy. There weren't enough batteries, charging devices, or generators in the week or two after landfall. "Check your batteries" goes double for any sort of portable/mobile device, by the way. I ran into problems with my laptop battery during the outage, which was no end of headache. Spares are a good thing for a survival or grid-down situation. "Young men, beware of murder. It may lead to theft and, from there, to telling lies." Standing invite to all ZSers: If you're ever down Carolina way, the first round's on me. The crayon boxes that Walmart sells, work fairly well for storing 16 or so AA batteries. I haven't counted how many AAA. Someone else was using the plastic boxes for reloaded cartridges. A multimeter with a dedicated battery test position is best, because it tests the battery under load. A regular meter just checks the voltage. Strength Of My Life, whom shall I dread? When them evildoers approach to devour my flesh.